Makoto Winkler, a wide-ranging baritone who handles dramatic leaps in his vocal lines with consummate ease, tries to answer the question: To be or not to be Nothing. 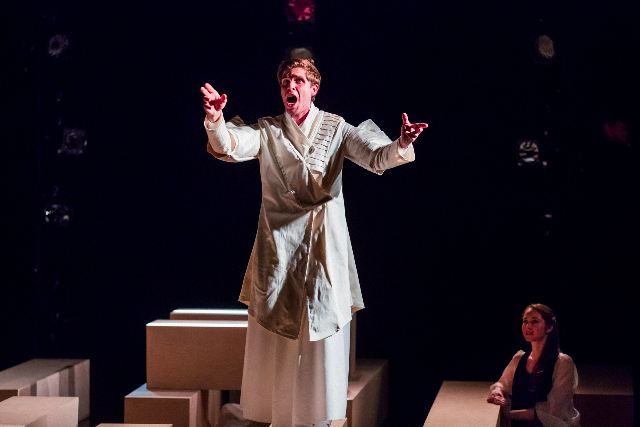 Jesse Malgieri sings the Man with grace and abundant good humor in a voice that captures each nuance of the score. 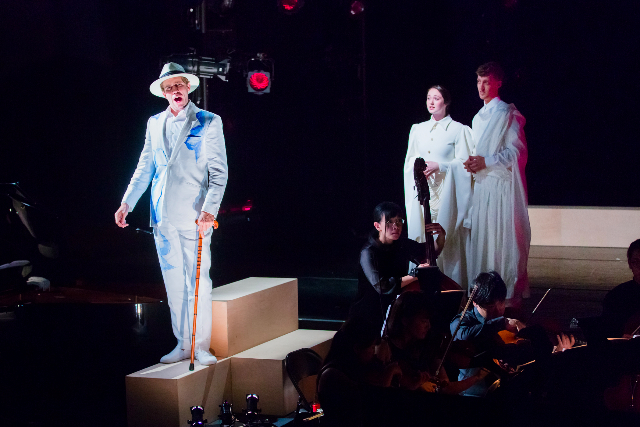 Moto Osada’s first opera, Four Nights of Dream, like the composer, is a cross over between East and West. Osada composed the music and the libretto. The flexibility taking on both roles gives him has yielded a work of exquisite sensibility. 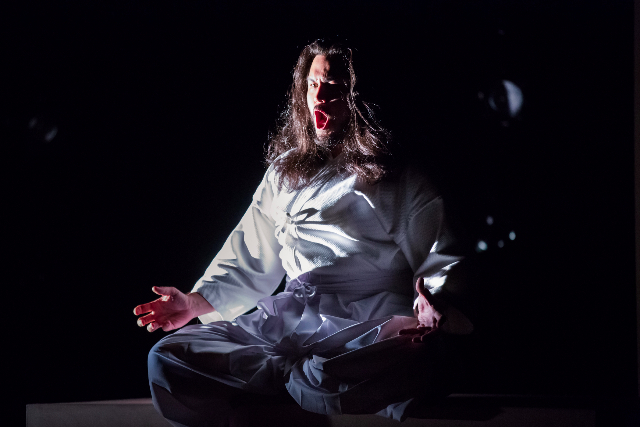 Noh drama’s emphasis on essence and not story line fuels the dreams. The humor of a man in a Panama Hat who pursues pigs until they get him feels very Western. A man who seeks 'nothingness' is eastern; his failure to find it very much of the west. The stories are based on Natsume Soseki’s Ten Nights of Dream. Soseki, who invented his last name which means stubborn, is so popular in Japan that he appears on a bank note. 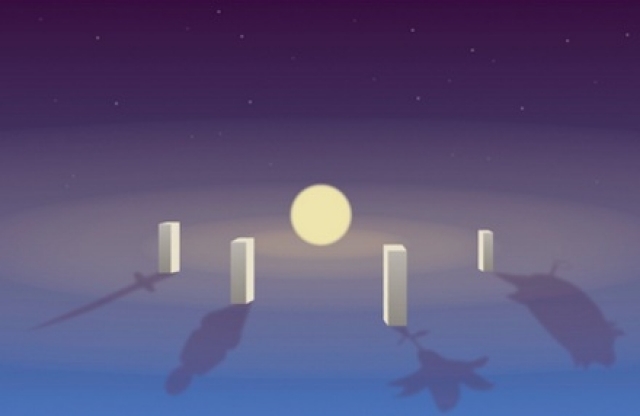 The dreams on which each of the four very distinct sections of the opera are based have strikingly different tones. Their music is set to match. Yet the over-arching sense is of a whole. Costumes by Oana Botez are distinctly Japanese. All the men wear flowing robes, many of them draped and winged. Some have designs and others are a lush white which changes color with the lights' rainbow offerings in green, red and blue. The lighting by Tuce Yasak is particularly effective. Many head lights hang at the back of the stage. They are invisible when a solo spot light shines on a performer. When the focus shifts to blinding insights or the unbearable, multiple lights shine right in the audiences’ eyes. We are curiously brought closer to the dream in our confused and blinded state. Together with rectangular pillars, easily moved to form a bench or a tower, all elements are woven together in Mimi Lien's suggestive set. Direction by Alec Duffy is stately, as characters always move to the rhythm of the music. Martial beats which start the first dream turn to jazzy syncopation and so too do stage movements. For all its variety the music coheres. While the visual is deeply rooted in Japanese culture, with the humorous exception of a Panama hat, the music is suspended in geographic space. It has very much its own character. One is struck by the percussive send offs of the woodwinds and violins often delicately wafting a series of top notes. The chamber orchestra is positioned cheek by jowl with the stage. A double bass player, silhouetted against the set, merged a listener's eye and ear. All of these effects are anchored in the piano, itself a crossover between percussion and those lovely bell-like top notes. Kaito Kobayashi was impressive as he underpinned the score in the piano's bass and chimed at its tinkling top. The orchestra is Japanese. All the vocalists are New Yorkers. The singing was excellent in all six roles. Young soprano Marisa Karchin stood out in lovely explications as storyteller and her emotional response to a dying woman and sad husband. 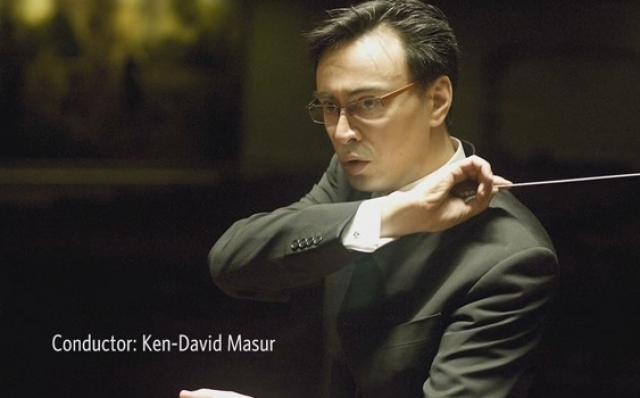 Ken-David Masur has all the tools required for a sublime conductor. His arm movements and hand gestures are clear and clearly conveyed to instrumentalists and singers. They are choreographed with a smooth gentleness that belies the firm control he elicits as he brings Osada’s music to life. He is the Boston Symphony's Associate Conductor and will conduct a highly anticipated Peer Gynt in Symphony Hall in October. All of this is in the service of a fascinating composer whose work can't be categorized. One moment you hear a march, the next jazz. Tunes are not referential. The music does not sound like anyone but Osada. He can call out the textures of horns and drum beats. He writes lovely lyrical lines. Each of his moods is chosen at just the right time. This troop goes on to Tokyo next week to perform at their cultural center. The renovated theater at the Japan Society was a perfect venue for the American premier of Four Nights of Dream. Performances on September 15 and 16 are sold out, but there is a wait list. 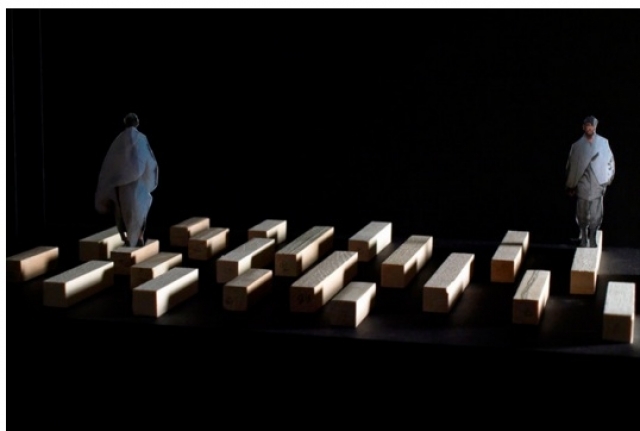 Performances in Tokyo are on September 30 and October 1 at the Tokyo Bunka Kaikan.